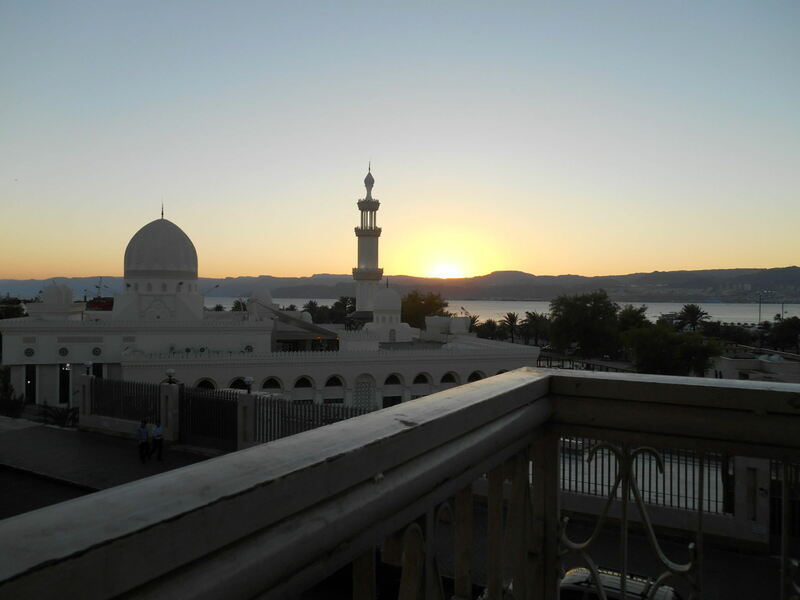 5 Things to do in Aqaba, Jordan without going diving or snorkelling. Nightfall from our hotel balcony over the city of Aqaba in Jordan. 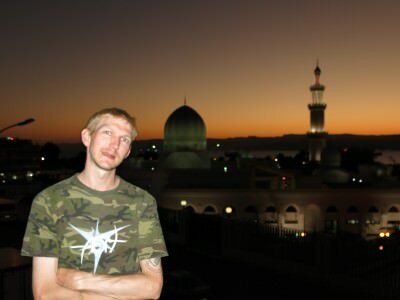 Being Jordan, and being the Middle East, Mosques are everywhere and to be honest, you never get bored of them. They all seem to stand out and be focal points in towns. 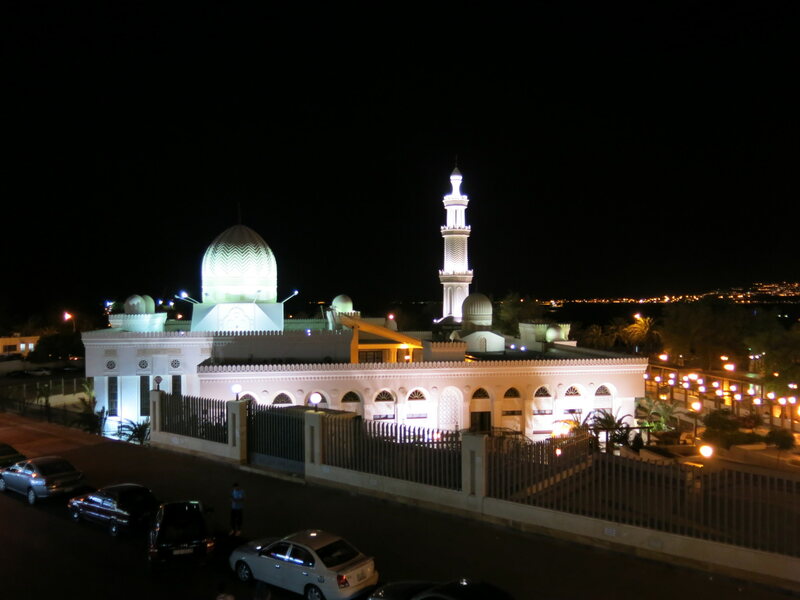 I seen a load of the Mosques in Aqaba but will mention the Al Hussein Bin Ali Mosque, as it seems to be the biggest and most standout Mosque in the city. 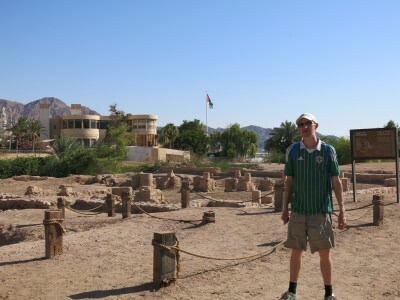 Right in the city centre of Aqaba are the ruins of an old city. Known as Early Islamic Ayla, these ruins are just a small reminder of a city that was once here. While it’s merely a small area with a few brick foundation remains, it will keep archaeologists happy and as it’s free to see, backpackers can tick off another “lost city”. At the ancient ruins of Ayla in the city of Aqaba in Jordan. Yes, this old city which sits nicely on the Red Sea and the Gulf of Aqaba also has a castle! While it’s currently being renovated ready for an opening to tourists, you can still peer into it from the outside and walk your way round. The castle dates back to the times of the Crusaders and the 13th Century. Lawrence of Arabia apparently rode from here to Egypt to announce victory in a war in 1916 where the Turks were ousted. 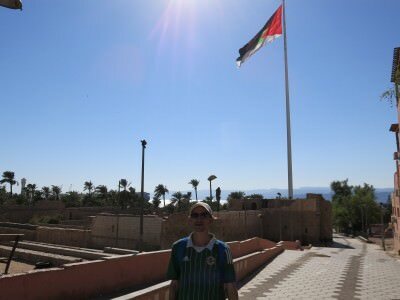 The Jordan flag flies high over the lowly Aqaba Castle down near the sea front. I spent two nights in Aqaba and we stayed at the Al Shula Hotel on Raghadan Street. We asked for a double room with a balcony view and this was totally amazing for watching the sunset over the Red Sea. We spent one night watching the sunset on the hotel balcony. Post sunset in Aqaba from our balcony. And another night down by the Red Sea watching the sunset. Both were amazing. This is a gorgeous place to view sunset. Watching sunset by the Red Sea in Aqaba in Jordan. Where else in the world can you be in a city which, in essence borders five other countries within a 20 kilometre radius?? I can’t think of many, while I got up to three in Argentina a few years back (saw Paraguay and Brazil at Tres Fronteras), Aqaba has the distinction of sitting on the border to either 3 or 4 other countries, depending on your political standpoint. Aqaba sits on a quadruple border! From our balcony we could see Egypt, Israel and we’re in Jordan. Saudi Arabia is also close by. 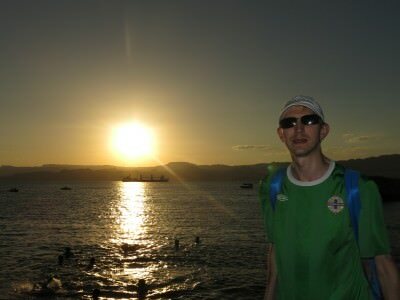 Egypt – From the Gulf of Aqaba you can see Egypt. 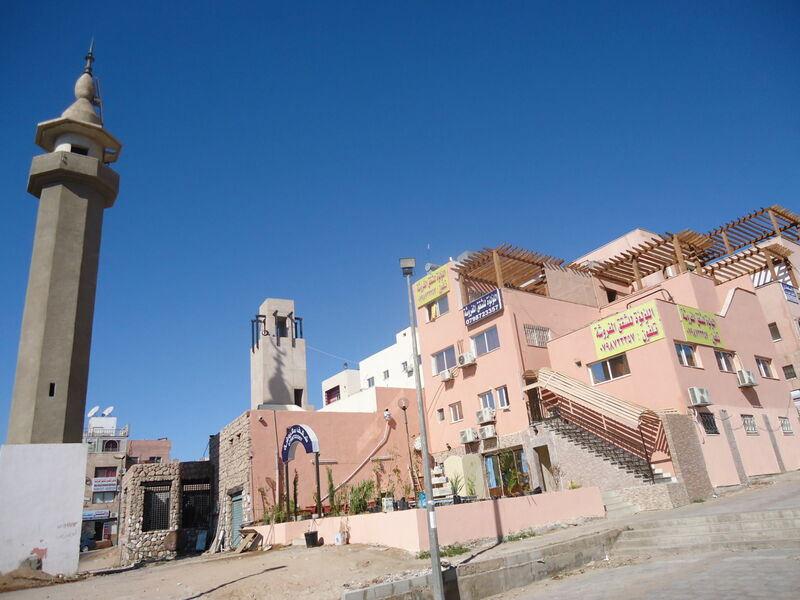 On the other side of the Red Sea lies the Egyptian border town of Taba. You can get there by ferry. Israel – Aqaba in Jordan has a land border with Eliat in Israel. Both cities are opposite each other across the Gulf of Aqaba. Saudi Arabia – The largest country in there Middle East is Saudi Arabia and it sits close to the border to Aqaba at a place called Ad Durra. The way things stand though, Saudi Arabia is a tough cookie to crack travel wise and you may have trouble getting in, so the land border is not advised. You could get a driver from Wadi Rum to drive you through the desert to get out of the jeep in Saudi Arabia just to say you’ve been there and then head back. But that would be a bit crazy. I’ll wait until the time comes until I decide to visit this colossal country. Palestine – Depending on your political standpoint, you may not recognise Israel as a state. If this is so, then Palestine is very reachable from Eliat. You can head north to the West Bank (Jericho, Bethlehem) and the Gaza Strip is to the west as well. Jodran sits on a load of borders. 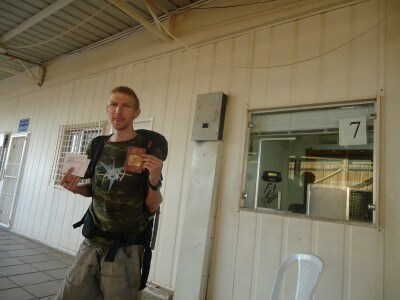 This entry was posted in Aqaba, Central Asia/Middle East, Destinations, Jordan, Lists, My Top 5s. Bookmark the permalink.